special offers and valuable information. Our mission at The CareGiver Partnership is to help family caregivers so that their loved ones can remain in their homes as long as possible. The CareGiver Partnership helps caregivers and their loved ones with answers to their caregiving questions, including information about home health care products and supplies, from our Wisconsin-based team of Product Specialists who are all current or former caregivers. The CareGiver Partnership is a leading direct to consumer retailer of adult diapers for urinary incontinence and bowel incontinence, including brands such as Depend, Poise pads, TENA pads, Attends, Prevail, SureCare, Tranquility and Wellness briefs. We offer nearly 600 different adult diapers, incontinence pads, adult pads, adult cloth diapers and bed pads. Why buy from The CareGiver Partnership? Customers say the main reasons they purchase their bladder control products from The CareGiver Partnership is because of the convenience of fast and free doorstep delivery ($50+), customer service excellence and dependability of delivery so they Never Run Out. They receive their delivery within 3 to 5 days, often just 1 or 2 days. Plus they can call for expert advice if needed. 1-800-985-1353 9-4 CST M-F. Wide selection. Always in Stock. They appreciate the ability to choose from more styles, sizes, absorbencies and brands than the stores -- nearly 600 -- nearly 10 times more. Always being in stock and the ability to try samples before they buy (over 100 choices for $3.49 S&H) is also important. While incontinence products are our specialty, we also offer 3,000 skin care, mobility, daily living aids (eating, dressing, bathing, toileting) and even freshly prepared home delivered meals for those who can’t get out. 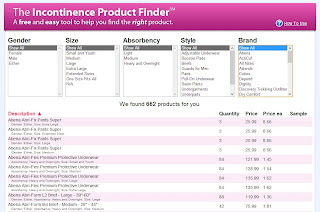 a free and easy tool to help you find the right product. Each of our Product Specialists are women. Why? Because the majority of our customers are women and they told us they’d prefer to speak to a woman if they call. We answer most calls by the third ring by the way. Moreover, each has been or currently is, a caregiver herself. Most importantly, they are all highly knowledgeable about the more than 500 incontinence products we offer. It's challenging to get good advice. The stores only carry a limited selection and the people there aren't knowledgeable - especially the 18 year old stock clerk. The pharmacists are too busy behind the counter to help these days. And they don’t offer samples or free doorstep delivery. Many customers appreciate the very convenient Never Run Out automatic scheduled delivery service where they choose how often they want delivery. They save $8 off their their first order and 5% on subsequent deliveries. The NRO order can be adjusted, paused or even cancelled at any time by simply sending an email or calling 800-985-1353. That’s it - very simple and convenient. NRO automatic scheduled delivery service...it's simple and convenient. Interested in joining our list for special offers and valuable information? 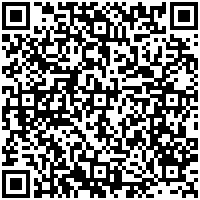 Just scan the code at the top of this article. Or, we encourage you to call us and speak to one of our knowledgeable Product Specialists if that is more convenient for you. 1-800-985-1353 (M-F 9-4 CST).